Knitting stitch patterns are fun to knit. You can let your imagination gone wild with these stitch patterns. Try them and have fun with them. Knit a bunch of washcloth for yourself and as gifts. The patterns listed below are all formed by knit, purl, rib, and lace stitches. I plan to add cable knit to this page in the future. 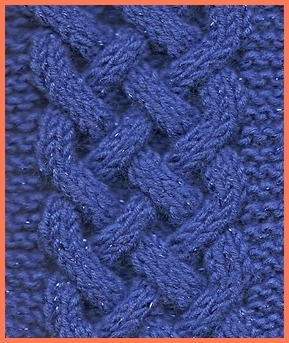 Celtic Plait in blue is one of many cable sts patterns you'll find here. Cascading Leaves is one of my favorite patterns. I love learning and finding new knitting stitch patterns. Even though I don't really have all the time I want to enjoy knitting them. I love to design different things out of these stitch patterns. In the past, I have used laces and cable patterns to design hats and scarves. They turned out quite nice. I will gradually add more knit stitch patterns to this page. As you know knitting take time. Let me know what pattern you like to see if you can't find it from here. Please do send a photo and pattern to share with us if you've designed any interesting patterns. Click on links to see photos and instructions. Garter Stitch Rib (will link you to my FB Fan page where I post the pattern) This is a simple and beautiful pattern beginners will love. 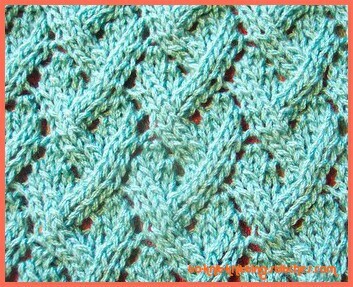 Single Lace Rib Pattern - This is another pattern I used for my dishcloth. Go to Dishcloth #2 to see the pattern. Skip the first and the last five sts for the actual pattern. *New* Feather Lace Love this sophisticated look! Fishtail Lace Another fun lace to knit. I used this pattern to knit this hat. Feather and Fan This is an all time knitter favorite. Got to have something knit with this. Scallop Pattern I used this pattern in my girl's scallop edge skirt. When knitting it in rows add one knit st (right side) at the beginning of the pattern. Fern diamond Pattern This is one of the patterns I knitted dishcloth with. 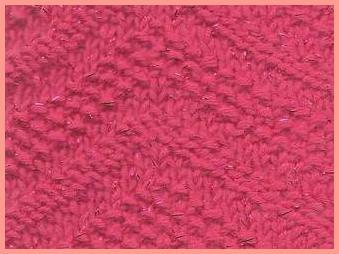 You can find this pattern on the Dishcloth pattern #1 at the top of dishcloth page. The actual pattern is between the two marker (after k5, and before the last k5 of the right side). These first five sts and last 5 sts were extra sts I added for the border. 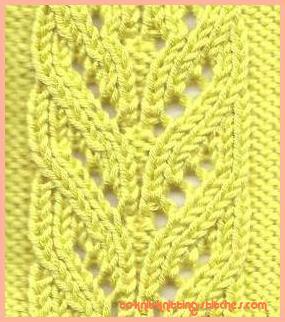 Little arrowhead - See this pattern on my Dishcloth pattern #3. Pretty Lacy Edge - Delicate and beautiful. Great for home projects! Garter-Eyelet border - Look great on my scarf! Easy Eyelet Edging - Lots of eyelets for this one. Row 1 (right side): K1, *p3, [k1,p1] twice, k1, p5, k1, [p1, k1] twice, p3, k1, repeat from * to end. Row 2: P2, *k3, [p1, k1] twice, p1, k3, p1, [k1, p1] twice,k3, p3; repeat from *to last 21 sts, k3, [p1, k1] twice, p1, k3, p1, [k1, p1] twice, k3, p2. Row 3: K3, *p3, [k1, p1] 5 times, k1, p3, k5, repeat from * to last 20 sts, p3, [k1, p1] 5 times, k1, p3, k3. Row 4: K1, *p3, k3, [p1, k1] 4 times, p1, k3, p3, k1; repeat from * to end. Row 5: P2,*k3, p3, [k1, p1] 3 times k1, p3, k3, p3; repeat from * to last 21 sts, k3, p3, [k1, p1] 3 times, k1, p3, k3, p2. Row 6: K3,*p3, k3, [p1, k1] twice, p1, k3, p3, k5; repeat from * to last 20 sts, p3, k3, [p1, k1] twice, p1, k3, p3, k3. Row 7: K1, *p3, k3, p3, k1, p1, k1, p3, k3, p3, k1; repeat from * to end. Row 8: K1, *[p1, k3, p3, k3] twice, p1, k1; repeat from * to end. Row 9: K1, *p1, k1, p3, k3, p5, k3, p3, k1, p1, k1; repeat from * to end. Row 10: K1, *p1, k1, p1, [k3, p3] twice, k3, [p1, k1] twice; repeat from * to end. Row 11: K1, [p1, k1] twice, p3. k3, p1, k3, p3, *[k1, p1] 4 times, k1, p3, k3, p1, k3, p3; repeat from * to last 5 sts, [k1, p1] twice, k1. Row 12: K1, [p1, k1] twice, p1, k3, p5, k3, *[p1, k1] 5 times, p1, k3, p5, k3; repeat from * to last 6 sts, [p1, k1] 3 times. Row 13: P2, *[k1, p1] twice, k1, p3, k3, p3, [k1, p1] twice, k1, p3; repeat from * to last 21 sts, [k1, p1] twice, k1, p3, k3, p3, [k1, p1] twice, k1, p2. Row 14: K3, *[p1, k1] twice, [p1, k3] twice, [p1, k1] twice, p1, k5; repeat from * to last 20 sts, [p1, k1] twice, [p1, k3] twice, [p1, k1] twice, p1, k3. Repeat this row to from Moss Stitch Pattern. I hope you have fun with these knit stitch patterns!